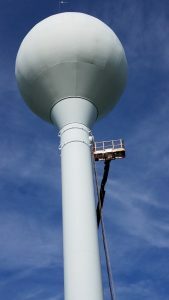 OCWA recently completed a complete rehabilitation of the 150,000 gallon elevated water storage tank located in the Pompey Pines neighborhood of the Town of Pompey. 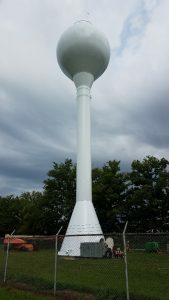 The tank is located off Pompey Center Road near the intersection of Indian Hill Road, and was built in 2005. Recent inspection of the tank identified accelerated corrosion and a need to rehabilitate the tank to prevent permanent damage to the steel components. The work was bid out and Amstar of Western, NY Inc. was the low bidder and awarded the contract. The pricing in the bid was favorable so OCWA elected to complete a full rehabilitation of the interior and a re-coating of the entire tank exterior. Based on the premium products used in the rehab and the strong quality control employed by the contractor and our project inspectors, OCWA anticipates that the new coatings will easily last 20+ years. During the project the water system in this area was operated directly from our pumping station to avoid interruption to the customers as the work progressed. The project was completed on-time and below budget and the tank is now back in service. It will be inspected in one year to verify that the coatings are performing well and that no touch up repairs are necessary as part of the contractor warranty.